The Contoller accesses the Model (a runtime data repository) and the View. The View then accesses the Model. Exactly how does that work? The Controller ultimately is the logical decision point. What sort of logic? Typically, the Controller will retrieve, build, or modify a Model base on some triggered action. 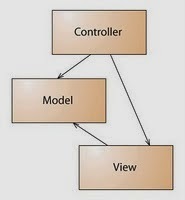 The Controller then decides which View is appropriate via some internal logic. At that point the Controller will push the Model to View. 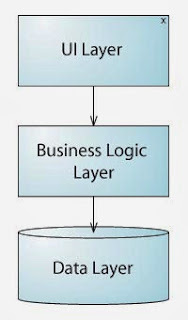 The UI Layer has access to the Business Logic Layer, and the Business Layer has access to the Data Layer. But the UI Layer cannot directly access the Data Layer. 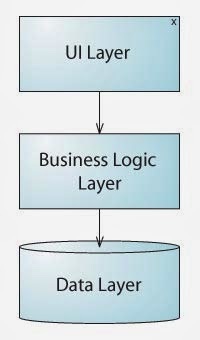 In order for the UI Layer to access data, it must go through the Business Logic Layer via some kind of interface. If it helps, you could think of each layer as one big loosely coupled component with strict design rules of access between layers.